A top Gujarat government insider has disclosed to Counterview that biennial Vibrant Gujarat business summits, sponsored by Gujarat chief minister Narendra Modi, has mainly attracted industries which are in the “most polluted” category. Quoting sources in the Gujarat Pollution Control Board (GPCB), the state government’s official anti-pollution watchdog, the insider has revealed there has been a massive around 2.5 times rise in “highly polluting” category between 2007 and 2012. The insider said, for the sake of “internal analysis”, the state government’s environment and forests department has categorized industries into three different categories. There are red industries, which are “high polluting”; then there are orange industries, which are “moderately polluting”; and finally there are industries which are “non-polluting industries. “In 2007, in all, there were in all 8,013 registered industries in Gujarat, out of which 5,163 industries were in the highly polluting sector and were therefore categorized as red. The number of registered industries jumped in the next five years to 27,892, and so did the industries that were categorized as red. In 2012, there were 16,770 registered industries categorized in the red category, a jump of exactly 225 per cent”, the insider pointed out. 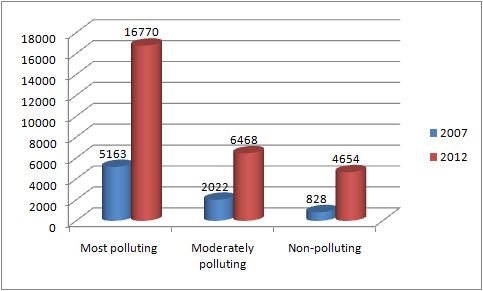 In fact, despite loud the talk of emphasizing on the “non-polluting industrial sector”, as also international pressure to encourage non-polluting industries, there was very little fall in the percentage of highly polluting or red sector industries in five years. In 2007, the “red” industries formed 64 per cent of all registered industries, and after a rise of 225 per cent, they formed 60 per cent of the total in 2012. During the five years in the question, the orange, or moderately polluting industries, rose from 2,022 units to 6,468, and the green – or non-polluting – industries remained a poor third, despite an increase from 828 to 4,654. Significantly, these facts have come to light at a time when the Central Pollution Control Board (CPCB) has, for the second time, identified Gujarat's chemical industrial hotspot, Ankaleshwar, as the “most polluting” industrial region of India. The insider underlined, "Examples of industrial pollution are observed along the 400 km stretch between Ahmadabad in Central Gujarat to Vapi in the southern part of the state, though efforts are being made to reduced pollution. This area is dotted with hundreds of small and medium factories that manufacture chemicals, dyes, paints, fertilisers, plastic, pulp, and paper. Untreated waste from these factories is the main cause for the pollution of air, water, farmland in the vicinity of these industrial units."